Taliadau BACS i gyfri y clwb gyda eich enw + “Dolig” fel reference. Gyrrwch neges am fanylion y cyfri. Taliadau arian parod drwy drefniant. I’m glad to say there is a significant interest in this years Christmas Party, and therefore to ensure I have booked enough space for everyone, I will have to ask for a £10 deposit payable before the 1st of October. It may be possible to book after this date but it will be subject to availability with the venue. Balance will need to be paid by 15th of November. 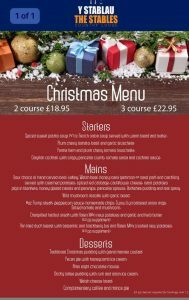 Cost £18.95 for two course or £22.95 for three course. Pre-selection only. If you know how your stomach will feel in two months time, you are welcome to send your selection to me. Warm welcome to your partners snd friends of the club. BACS payment to club’s account with your name and “xmas” as reference. Send me a message for bank details. Cash payment by arrangement.